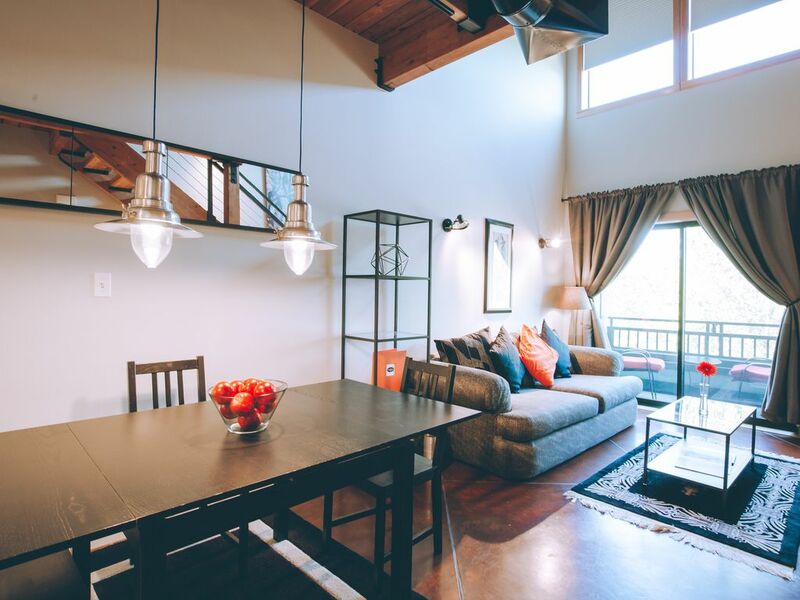 Our two-story, 1 bedroom, fully furnished, turnkey lofts feature the best Orenco Station has to offer. Whether sitting on your private balcony overlooking Town Center's Main Street with its lively activities, retail shops and restaurants or cooking in your loft’s gourmet kitchen, each one alone makes for a most memorable stay. Entertain friends in the modern vaulted living room and enjoy the large flat screen TV w/ DVD player, and an extensive selection of cable TV programming and our free DVD lend library. When the evening is over relax in your loft bedroom which features a California king size bed, a sitting area with desk and lamp, plus another large wall-mounted flat screen TV. As you would expect of The Orenco, all of your essential needs are met here as well with a full bath, adjacent walk-in closet and washer / dryer. There is not a gym attached but several in the area, including Orange Theory Fitness in walking distance.